Those who forget history are doomed to repeat it — but those who remember it don’t get off easy either! Last December I wrote a post entitled Who Will Stop the Snow? with apologies to John Fogerty. Today, I was thinking about that post and the irony of it, since I’ve spent a good part of the morning removing over 2 ft of snow from my driveway. When I went back and looked at the post I realized that it was written 5 days short of a year ago and I was bemoaning the huges amounts of snow on the ground. However, this year has been a little different. I’ve had all my firewood in (with some help from my nephew who brought two-thirds of it in from the back 40 for me). All the fall chores were complete before the snow came (unless I missed something that I’ll find out about in the spring). But the biggest difference, so far, is that the snow which is now about 3 ft high (just like last December 16th) has fallen within a 72 hour period. In fact, 2ft or more has falling within the last 24 hours. Thankfully my nephew is here for another visit and was able to help me get it cleared out of the driveway. He was running the ATV with a plow and I ran the snowblower. We still can’t get out since they haven’t been able to plow our road yet. When they do I suspect that there is another hour of shoveling ahead of us to remove the wall of snow that the plow will leave behind. 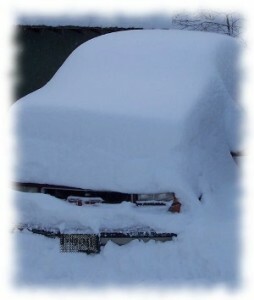 My truck is in there somewhere! I’m still looking forward to winter though. I love this kind of snow — white and thick. It is snow that you can actually play with. The kids will be sliding. I’ll be out snowshoeing and my daughter will get out her skis. Maybe this year my son will want to start one or the other. We’ve also got snowmobile rides and the toboggan run building ahead of us. It’s going to be a great winter. Even though we’re planning a trip to Florida this winter, we still love the Muskoka winter and all the fun we can have outdoors. It’s a wonderful time of the year — despite the snow shoveling part. What is winter like for you? Do you enjoy the snow or do you long to run from it? Do you even experience snow where you live? Why not share your favourite winter story with us in the comments! It snows every day here in winter. 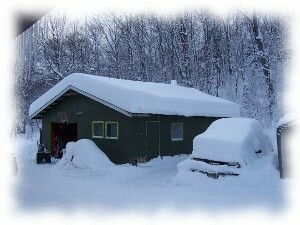 We have steeply slanted roof so that the snow slides off instead of collapsing the house. The kids are not allowed to play right next to the house — little children have died in our community from being under the roof when it avalanches. They get buried and no one can find them until it’s too late. The snow is 4 ft deep now where I haven’t shoveled. Currently, it’s raining – a wintry mix – which means it’s going to all freeze up very soon. I love sledding, but other than that, I’m not a huge fan of winter. I am a huge fan of being together as a family, though, and despite this always-winter-never-Christmas location in northern Japan, I am thankful. It sure sounds like you get more winter than the average bear. I’ve rarely had to deal with more than about 3 feet of snow before some of it melts.